We have been working hard to increase the numbers of appointments available for you. This has involved developing a partnership with other local practices, which we are pleased to tell you has now resulted in the formulation of the group named above. Chorley Central Collaborative Group consists of the following practices Regent House Surgery, The Chorley Surgery, Library House Surgery, Granville House Medical Centre, Euxton Medical Centre and Coppull Medical Practice. The new service available will provide access to GP appointments in the evening on week days up to 8:00pm and Saturdays and Sundays. The service is available to all patients within this group on a proportionate basis however it is important to be aware that the appointment may not necessarily be at this practice. These are all additional appointments so it is not the case that patients of other practices will now utilise all our appointments. We will use this surgery website to present all our patients with up to date news and information about our practice. We will keep it current with any developments or other details that we feel are relevant to you. The practice was founded in 1895 at 4 Park Road, Chorley. The present surgery building was acquired in 1986 and extended in 1995 with two further consulting rooms added in 2009. 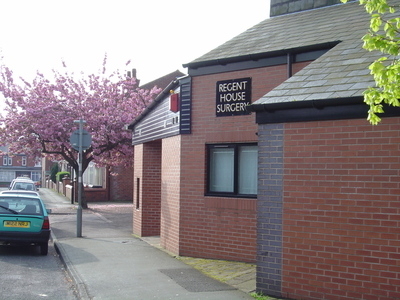 Regent House Surgery is a fully computerised modern group practice and during five successful years as fundholders we introduced many innovative improvements to patient care. There is easy access to the surgery for disabled people, and all services can be provided on the ground floor. Toilet facilities for the disabled are available. If you have any difficulty, or suggestions, please notify the practice manager. Do you really need A&E? If you become ill, there are a number of places where you can get help. During the winter season demand for appointments in General Practice often increases due to the rise in seasonal ailments etc . Patients who need to see a GP on a same day basis take priority and leave less bookable appointments for the routine requirements of other patients. This can result in extended waiting times for appointments and increases the number of patients who then choose to access other urgent care facilities. Patients who meet the following criteria can self refer to the Podiatry Services. Here at Regent House Surgery we utilise an electronic system for transferring patient records to and from other GP surgeries called GP2GP. GP2GP enables patients' electronic health records to be transferred directly and securely between GP practices. It improves patient care as GPs will usually have full and detailed medical records available to them for a new patient's first consultation. GP2GP is the project that enables patients' electronic health records (EHRs) to be transferred directly from one practice to another. GP2GP starts when a practice accepts a patient onto their list of patients for primary health care and ends when the EHR is transferred from the previous practice into the new GP clinical system. GP2GP electronic transfers will be more accurate and secure - and much faster than the current paper-based approach, which can take weeks to complete. There are some 9,000 GP practices in England. They each currently deal with an average 500 patient record transfers each year. Inner city and university practices deal with far more. Printing out the details of the patient health record held on the GP clinical system and then putting that print-out into the patient's 'Lloyd George' envelope, together with any historical paper records, laboratory forms, hospital referral letters and the letters that result from that referral. These documents are then transferred to the new practice via the local medical records transfer process. Upon receipt of the Lloyd George, the new practice reviews the information received, summarises the record and enters any appropriate information into their GP clinical system. The time it takes to receive a patient record from the time it is requested can be anything from a few weeks to a few months. As a result, the new practice often does not have the benefit of the old record when the patient attends for the first consultation. Once received, it can be very time-consuming for the new practice to key in the summary of the record into its own clinical system. GP2GP, on the other hand, enables an almost instantaneous transfer of a patient's EHR. As a result, GPs and their teams will be able to provide patients with a safer and more efficient service. Read more about the benefits of GP2GP. Information is a vital asset, both in terms of the clinical management of individual patients and the efficient management of services and resources. It plays a key part in clinical governance, service planning and performance management. The practice believes that accurate, timely and relevant information is essential to deliver the highest quality health care. As such it is the responsibility of all clinicians and managers to ensure and promote the quality of information and to actively use information in decision making processes. If you would like to see our full Information Governance Policy or any other practice policies please see practice Information. The practice is required by the Government under the terms of the latest GP contract to allocate all patients a named accountable GP by 30th June 2015. If you are over 75 years old you will have already been issued with the name of your named GP. Individual patients aged under 75 years will be informed of their named accountable GP at the first appropriate interaction with the practice. For convenience if you have a medical card your accountable GP will be the named doctor you are registered with. The practice does keep a record of your registered (accountable) GP. If you wish to be told the name of your accountable GP, please ask the receptionists when you are next in the surgery.